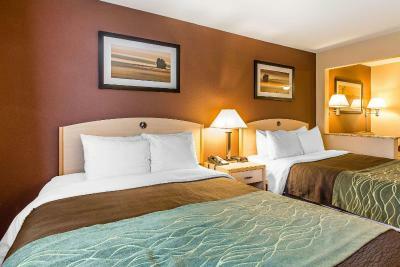 Lock in a great price for Quality Inn & Suites Loveland – rated 8.5 by recent guests! Very friendly and helpful staff. Room was large and very clean. I always like when i can park near my room. All the doors you had to have your room key. Excellent! When you leave the "Do Not Disturb" on your door. They do not disturb-house keeping. ++ Staff did accommodate us when we asked questions or needed something. It was clean. The bed was comfortable. The price was reasonable. The first impression was our interaction with the two gentlemen at the front desk. 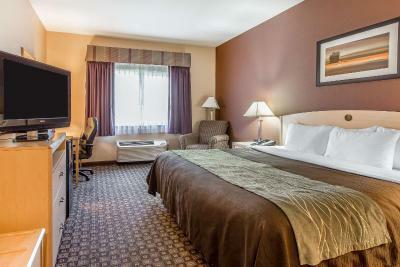 Exceptionally personable and accommodating. The gal that checked me in was fast, informative and courteous. Good location if I were going to spend time in Loveland, but I was supposed to stay in Boulder, my assistant booked me in Loveland on accident. Clean room. The breakfast was good, plenty of food and kept up well. Super friendly staff, great location and very comfortable. 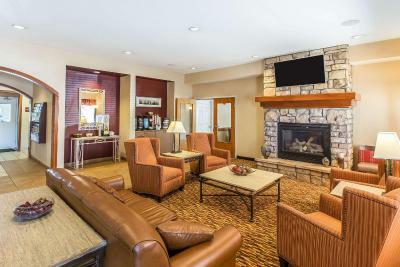 Quality Inn & Suites Loveland This rating is a reflection of how the property compares to the industry standard when it comes to price, facilities and services available. It's based on a self-evaluation by the property. Use this rating to help choose your stay! 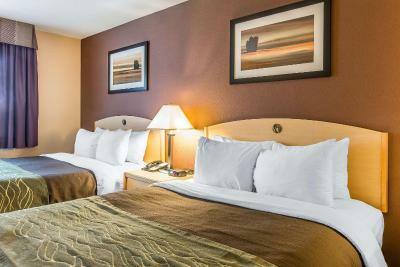 Located on Highway 34, the gateway to Estes Park and Rocky Mountain National Park, the Comfort Inn hotel is the perfect resting point for vacationing travelers. 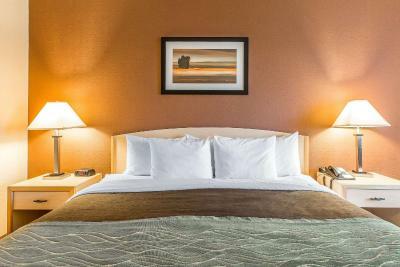 This hotel is minutes from the Budweiser Events Center and The Ranch Larimer County Fairgrounds and Events Complex. Colorado State University and the University of Northern Colorado are also in the area. 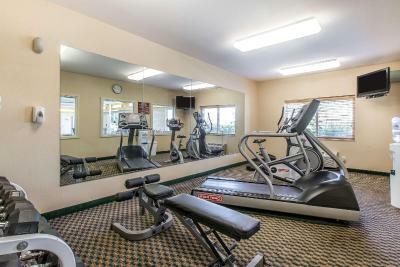 Amenities and features of this newly renovated, 100 percent smoke-free hotel include: free access to business center, free wireless high-speed Internet access throughout the hotel, indoor pool and hot tub, fitness center and flat-screen televisions in all guest rooms. Your Morning Breakfast is full of hot items, making breakfast at the Comfort Inn the perfect way to start your day. Enjoy our free hot breakfast featuring eggs, meat, yogurt and fresh fruit, cereal and more, including your choice of hot waffle flavors. Near the hotel, there are many local attractions such as Benson Sculpture Garden, The Promenade Shops at Centerra and Outlets at Loveland. Hiking, biking and other outdoor sports are abundant in the Loveland, Colorado area. A multitude of restaurant options await you. 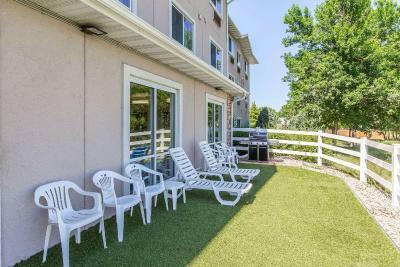 A sundeck with a gas grill is available for our guests to enjoy. Business travelers will appreciate the meeting room that accommodates up to 25 people for most events and business functions is available. 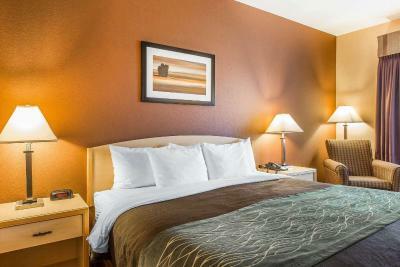 The hotel features a variety of suites for added value or extended stays. 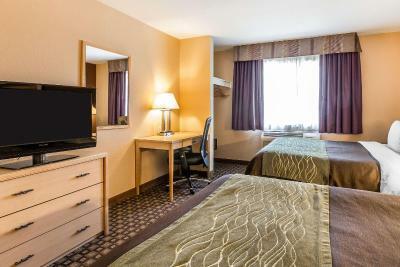 All rooms include flat-screen televisions, refrigerators, microwaves, hair dryers, irons, ironing boards, coffee makers and cable television. Hot tub suites are also available. 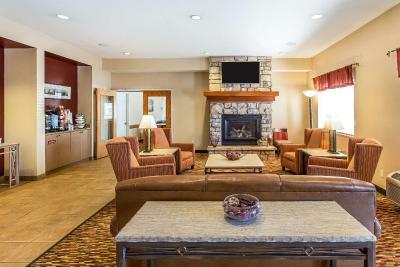 When would you like to stay at Quality Inn & Suites Loveland? 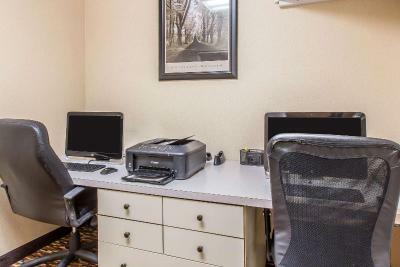 This air-conditioned room features a satellite TV, a microwave and a small refrigerator. An private bathroom with a hairdryer is also included. 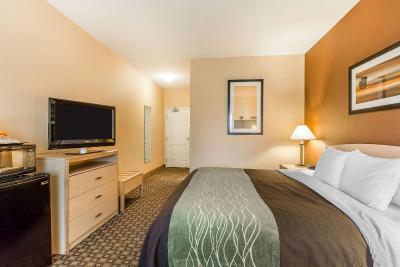 This air-conditioned suite features a seating area with a satellite TV, a microwave and a small refrigerator. An private bathroom with a hairdryer is also included. House Rules Quality Inn & Suites Loveland takes special requests – add in the next step! 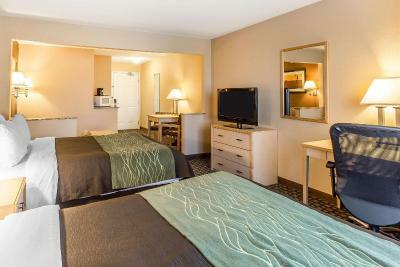 Quality Inn &amp; Suites Loveland accepts these cards and reserves the right to temporarily hold an amount prior to arrival. 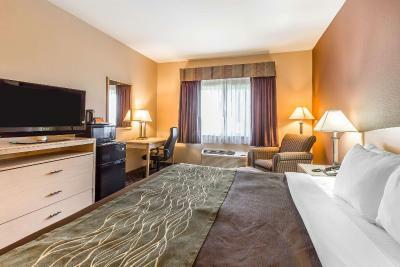 Quality Inn & Suites Loveland accepts these cards and reserves the right to temporarily hold an amount prior to arrival. Even though the bed had a good number of pillows they just weren't comfortable to sleep on. Beds to hard. The tv had to be reset when we got here. The rooms are too hot. For over $100 a night I really hoped for a better looking property, needs updates. The variety of breakfast could have been better. The fruit did not appear very fresh. The room was clean. The beds were very comfortable. The staff was welcoming and the value was pretty good for what I needed. The woman at the front desk when we went to check in on the late night shift wasnt the friendliess and she help accomodate us at all. The property was very clean. The beds were very comfortable. The front desk person put out ice scrapers in the morning as it was icy--very thoughtful.